Went to her new home on Monday 3rd July 2017. 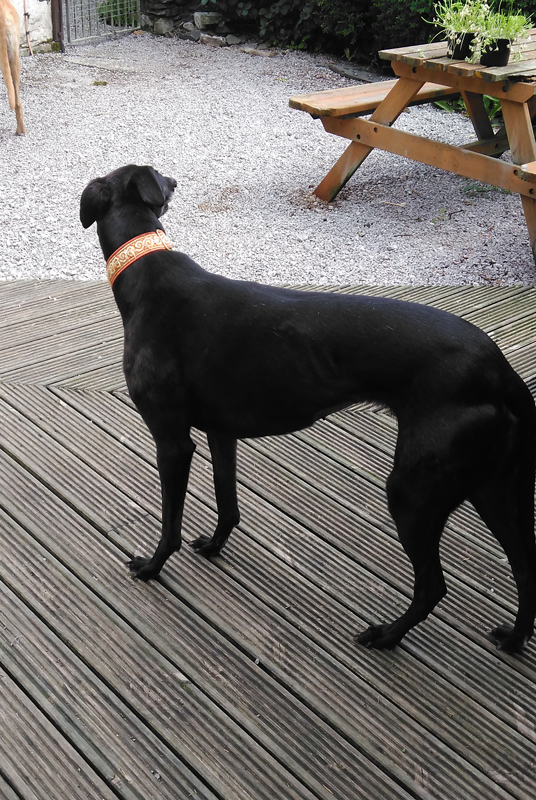 Becky is a lovely black ex-racing greyhound who has had 2 puppies. She is 6 years old. has a lovely sweet nature, is house trained, spayed, inoculated and microchipped. She's just had one dental but is due another towards the end of July. 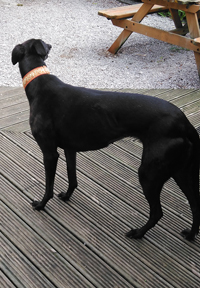 She has a lovely sweet nature but can be a little shy at times, walks lovely on the lead and travels well in a car. This afternoon we took Becky round to her new owner's house where after a few minutes she'd had a biscuit, been for a walk around the garden and began to settle in the living room. Having completed all the adoption paperwork we discussed collecting her in about 3 weeks time when she's to go back to our vets for the second half of her dental. Becky had become quite fond of us and we knew from the way she kept looking at us she would want to follow us out the house so we did as we've done many times before. We suggested her new owner take her in the back garden and give us time to slip out the front door and leave before she brought her back in the house. We received a phone call this morning from Becky's new owner saying everything was fine, she's so good at night and she's a little darling. On Wednesday she started chattering her teeth as she was greeting her owner and she's started taking shoes, slippers and trainers to her bed. She's fine in the garden now but still a little wary of the traffic as it passes her if her walk takes her along the side of the road before going on the fell. In our Christmas card this year was a note saying Becky was great company, has made lots of friends (everyone loves her) both hman and doggy, but she is still wary of men.